In addition to our company headquarters in Durham, NC, MI maintains operations at 14 office locations in nine states and employs a full-time staff of almost 400 in addition to thousands of seasonal employees who assist in assessment scoring, test item development, and materials handling. With adherence to strict security guidelines, demanding deadlines, and our dedication to accuracy, MI has developed and scored tests in several critical content areas. Over the years, MI has been highly competitive in successfully winning and retaining many contracts with state and local departments of education, other educational agencies, and private businesses. Measurement Incorporated was established in 1980 in the basement of a former home on Woodrow Street in Durham, North Carolina. Since then, it has continued to grow under the leadership of Dr. Henry Scherich. From the beginning, MI has always maintained a humanistic, inclusive work environment for its employees to encourage increased staff morale, loyalty, productivity and ultimately, profitability. Measurement Incorporated participates in and supports programs involving student and employee education and enrichment, health and wellness, literacy, arts, historic preservation, community revitalization, and support for the disadvantaged and disabled. The members of MI’s management team have helped to build an enterprise with a distinguished reputation for quality control and excellence. 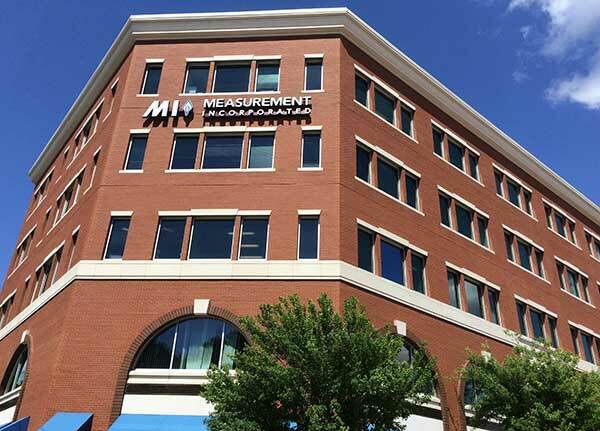 Under their leadership, MI has expanded its capabilities to incorporate a full spectrum of assessment services including research, test and item development, scoring, reporting, analysis and technical support. As president and founder of Measurement Incorporated, Dr. Henry Scherich provides the corporate management overview for all of MI’s contractual projects, supervising overall project operations and ensuring that the appropriate company resources are available at all times. Under his leadership, MI has achieved a reputation as the nation’s foremost contractor in the scoring of performance assessments. Since 1980, Dr. Scherich and the MI staff have completed large-scale test development, administration, and scoring projects for more than two dozen state departments of education as well as numerous other projects involving field tests, certification exams, machine scoring and processing, development of instructional instruments, and program evaluation. MI’s extensive corporate capabilities are largely a reflection of Dr. Scherich’s wide ranging interests in all aspects of educational assessment. Dr. Scherich earned a Ph.D. in Educational Psychology with a specialty in Statistics and Measurement from Southern Illinois University at Carbondale in 1975. After earning his doctorate, he worked for the Houghton Mifflin Company as Director of Test Research and Scoring Services and for NTS Research Corporation as Measurement and Data Management Center Director. These positions involved test development, test standardization, research projects, scoring services, Title I evaluations, and special projects. Dr. Scherich has also been a high school teacher and guidance counselor. MI’s computer programming, data analysis, document scanning, and score report services are performed under the supervision of Mr. Nelson Androes. His responsibilities include planning, coordinating, directing, and designing all operational activities of the IT department as well as providing direction and support for IT solutions that enhance mission-critical business operations. Mr. Androes was previously software development manager at MI, overseeing the design and development of all software solutions relative to educational assessment data processing and score reporting. Prior to joining MI in 2004, he worked for IBM as software development manager and software engineer and at NCS (now Pearson) as a software developer. Mr. Androes earned a Bachelor of Science degree from Kansas State University and is familiar with several programming languages, software tools, and environments. Mr. Avila is responsible for financial reporting and other administrative functions of Measurement Incorporated, including payroll, tax compliance, benefit program administration, accounts receivable, and accounts payable. Mr. Avila has a strong background in both large and small business management and in international finance. Prior to joining MI in 1994, he worked as chief operating officer for North Carolina First Flight, Inc., where he developed the company’s business plan and corporate policy, expanded banking relations, managed financial portfolios, provided financial reports, and negotiated multi-million dollar high technology investment deals. He also worked for Carolina Power and Light Company as financial analyst and for R.J. Reynolds Tobacco International, Inc., concerning its financial interests in Latin America. Mr. Avila, a Certified Public Accountant, received a Bachelor of Business Administration degree in Accounting from Georgia Southern University and a Master of International Management in Marketing and Finance from the American Graduate School of International Management. Ms. Bazemore oversees MI’s assessment technologies initiatives, including online testing, machine scoring, and web-based formative assessment tools. She is a certified Project Management Professional and has been working in the fields of technology and educational assessment since 2002. Prior to becoming the VP of Assessment Technology, she provided strategic direction for MI’s secure online test delivery system (MIST), managing product requirements and the software development schedule. Under her direction several large-scale assessments were transitioned from paper and pencil to online administrations. Ms. Bazemore’s previous experience includes Project Management, Quality Assurance management and software testing. Ms. Bazemore received her Master of Business Administration degree from East Carolina University in Greenville, NC. Dr. Bunch serves as a director of the corporation and has direct oversight of the psychometric group, having had oversight of the entire Research and Development Division for more than 30 years. Since joining MI in 1982, he has established MI as a trusted vendor of high-quality test development and related services. His team of more than 80 project directors, psychometricians, editors, content specialists, and support staff has successfully carried out test development, program evaluation, and research activities for 20 state departments of education and numerous local education agencies, corporations, consortia, and institutions. Dr. Bunch’s expertise in the development of criterion-referenced, high-stakes testing programs is well known among assessment professionals. His advice in both technical and practical matters related to assessment programs is widely sought, and he contributes regularly to the advancement of those programs through national organizations such as the American Educational Research Association, the Council of Chief State School Officers, and the National Council on Measurement in Education. He has taught graduate-level statistics and research methods classes and has been a regular contributor to Mental Measurement Yearbooks since 1985. In 2005, he was recognized by the Buros Institute of Mental Measurements as a Distinguished Reviewer. He has published, with Dr. Gregory Cizek, the graduate-level text, Standard Setting (Sage Publications, 2007) and is in great demand as a reviewer and discussant for standard-setting research and as a leader of standard-setting activities. Dr. Bunch earned a Ph.D. degree in psychology (Measurement and Human Differences) from the University of Georgia in 1976. Prior to joining MI in 1982, he served as research psychologist at the American College Testing Program (ACT) and senior professional at NTS Research Corporation. Since joining MI, he has been active not only in the profession but in the Durham community as well, serving on and chairing boards of local education and human service organizations. Mr. Horton supervises the personnel responsible for distribution, collection, storage, and recycling of test materials, and the acquisition and maintenance of physical properties. Mr. Horton joined MI in 1990 as warehouse manager and assumed the role of Facilities Manager in 1994. Prior to joining MI, he had been warehouse supervisor for Redemco Universal Beverage Company in Avon, Massachusetts. Dr. Kelsh assumed the role of Vice President of MI Evaluation Services (formerly MAGI Services, Inc.) and Executive Director of Westchester Institute for Human Services Research, Inc., in 2008 after having been with both organizations since 1993. He is one of the nation’s most respected authorities in education evaluation and research and has directed many studies of national significance. He is a certified school and district administrator and formerly served as the lead researcher for the New York State Education Department Office of Higher Education. As the Principal Investigator for numerous federal, state, and local projects, Dr. Kelsh has authored a wide range of research reports and policy analyses. He is an active member of the American Educational Research Association (AERA), the American Evaluation Association (AEA), and member and former President of the New York State Council for Exceptional Children (NYCEC). Prior to his employment at MAGI, Dr. Kelsh worked for the Research Foundation of the State University of New York (SUNY) and the New York State Education Department. He holds an Ed.D. in Program Evaluation from SUNY. Dr. McClintock has 20 years of experience in psychological research, assessment, and project management. As the Vice President for Research and Development, he supervises a staff of more than 80 professionals and provides leadership in all aspects of test and item development. He directs Project Managers for a number of projects, including MI’s Benchmark Assessment Item Bank. Prior to joining MI, he was Director of Examination Services & Research for the American Board of Anesthesiology where he advised the Board of Directors on psychometric issues for objective and performance examinations, conducting a number of validity and reliability studies that allowed the Board to refine and improve the certification and testing process. Additionally, Dr. McClintock served as the Director of Programs for a major certification vendor, where he directed the test development activities of numerous certification programs. In this capacity, he conducted item-writing workshops, standard setting studies, and role delineation studies. He has published peer-reviewed articles on data forensics and erasure analyses. Dr. McClintock earned a Ph.D. in Clinical Psychology from the University of North Carolina, Chapel Hill. His professional focus was on psychological assessment. In addition, he developed an online psychology course for the University of North Carolina, and taught undergraduate psychology courses for 13 years. Dr. Palermo oversees and directs performance assessment efforts for all contracts with scoring components. He assists clients in establishing scoring criteria, conducting rangefinding meetings, refining scoring guides, selecting training materials, and supervising the training and scoring process. Additionally, he provides strategic oversight of the development and support of MI’s Automated Writing Evaluation (AWE) products for the explicit purpose of improving student writing outcomes. Dr. Palermo serves as MI’s point of contact with various state and local policymakers, strategic partners, and education organizations. Prior to this role, he oversaw operations of a number of projects for individual states/territories and multi-state testing consortia. Dr. Palermo has K-20 teaching experience. He has taught in the North Carolina public school system and has also taught undergraduate and graduate courses at North Carolina State University. Dr. Palermo holds a Ph.D. in Educational Psychology from North Carolina State University. He is a member of the American Educational Research Association (AERA) and the American Psychological Association (APA), and regularly contributes to the educational research community by presenting at conferences and authoring and reviewing peer-reviewed journal articles; his original research has been published in such top-tier journals as Teaching and Teacher Education and Contemporary Educational Psychology. His research interests include teachers' beliefs and values as related to professional choices including engagement in professional development and commitment to the teaching profession, as well as AWE, in particular interventions that utilize AWE to improve the teaching and learning of writing. Dr. Ridge oversees the management of nearly all of our major performance assessment scoring contracts. He assists these clients in establishing scoring criteria, conducting rangefinding meetings, refining scoring guides, selecting training materials, and supervising the training and scoring process. Previously, Dr. Ridge led the team that develops and manages MI’s assessment technologies, including online testing, artificial intelligence scoring, and web-based formative assessment tools. During his tenure at MI Dr. Ridge has managed state contracts and large-scale performance assessment scoring projects for more than 20 state departments of education and other MI clients, beginning in 1987. Dr. Ridge earned a Ph.D. in Educational Psychology in 1999 and an M.Ed. in Educational Media/Instructional Design in 1992 from the University of North Carolina at Chapel Hill. He completed an internship in video training at the Duke University School of Medicine and has been a consultant in network multimedia training at the Duke University Medical Center Department of Radiology. Dr. Ridge has presented at a number of national research conferences and was awarded a 2001 American Educational Research Association Distinguished Paper Award. Mr. Wicker oversees the scoring system software development, document scanning, data analysis, and reporting of assessment responses. Mr. Wicker’s oversight includes managing the design, development, and implementation of computer software solutions for numerous clients relative to educational assessment data processing and score reporting. Additionally, he is responsible for planning, maintaining, supporting, and upgrading all scoring systems and applications. Mr. Wicker has been with MI since 2002, and was previously a Software Development Manager in the IT department. Mr. Wicker earned a Bachelor of Science in Computer Science from Methodist University. During Mr. Wicker’s tenure at Measurement Incorporated, he has been involved in the transition from paper based assessments, scoring, and reporting to online delivery of those services.